I put up a post titled "Ask me anything," and I mean it.1 Feel free to keep submitting queries if you're curious! For this installment of Answers to Ask Me Anything, I'm going to talk about how and why Sam and I have worked from home in a family business. Gotta start employee training early. I feel really weird asking this because money is such a personal, sensitive topic to me, but I really want to know how you and your husband make your living. I think you've made reference before to the fact that you both have a business working at home, and I was wondering what it was. My husband and I are experimenting in "unjobs" (he has his own business and we're working on blogs and websites) and I'm interested in how other people make it work. I'd love to know how you pronounce your son's name! I'm also curious as to how you got interested in and started your business from home. All right, easy one first! Mikko is pronounced MEE-ko (for English speakers, at least). See? Easy! It's Finnish, so it just looks hard. I tried learning Finnish once and gave up after about a couple days (or was it hours? ).2 It's the Finnish form of Michael. Ok, on to business matters. When Sam and I got married, he had been working for about a year at a nonprofit in the Chicago area. I had been doing contract work for them and thought I could get a job there once I graduated, but they told us, belatedly, that they had rules against married couples working in the office together. Strangely enough, they didn't have office space for Sam, so we both worked from home — as if less hanky-panky could happen that way than if we both worked in the office! Our Indiana office, or what was supposed to be the bedroom of our apartment. This was apparently before we knew how to take pictures. Anyhow, I kept working freelance (editing, writing, graphic design), and Sam kept working salary but telecommuting (graphic design, writing, editing — yes, the same things, but in a different order, see?). On the side, I started a freelance online editing business but did diddly-squat with it, so I had a few faithful clients and some one-offs but was generating very little income. Sam and I thought, As long as we're working from home, why not move our home from Indiana to somewhere…else? 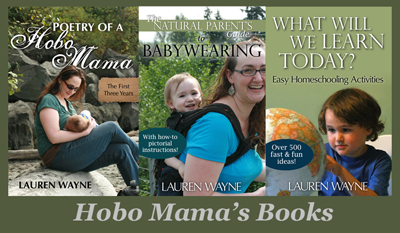 So we moved to Seattle and kept up our work for the nonprofit for a couple years. Working on the road, so to speak. 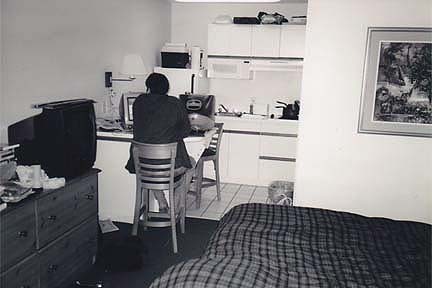 We stayed at this hotel for our first four months and then took a road trip through California, computers coming along for the ride. Note that we did not have laptops. 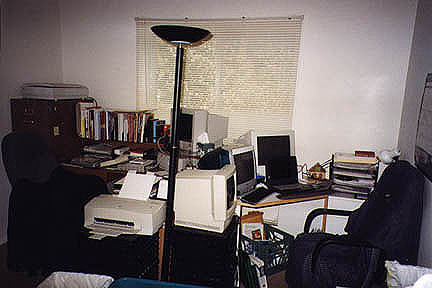 Our first, studio apartment in Seattle, where we carved an office nook from our dining area. Seriously, did I smear vaseline on the lens? So that was a fun gig while it lasted, working in the enjoyable city of Seattle but with a steady salary from the Midwest. And then they laid off Sam's whole department, which also effectively ended my contract jobs. So we had a choice at this point: After five years of working from home, we could each get "real jobs" and go work in an office (separate offices) and not see each other during the day. Or we could try to make something work from home. Valuing pajamas as business-wear over a steady paycheck, we went the foolhardy route. When we had moved to Seattle, we had adopted a cat (stay with me here) and then realized when we went on vacation — hey, there's no one around to check in on her. That's when we discovered the professional world of pet sitting. Our cat sitter was awesome (I think our cat was always sad to see us return). And we paid her so much money, we thought: Hey, we could be awesome and get a bunch of money, too! We were now taking the kind of pictures you don't have to squint to figure out what's happening. So I researched pet sitting, and we hung out our online shingle, and soon we had a thriving cat sitting business. (Cats only, which made us sound exclusive, but really just meant we were too lazy to walk dogs.) 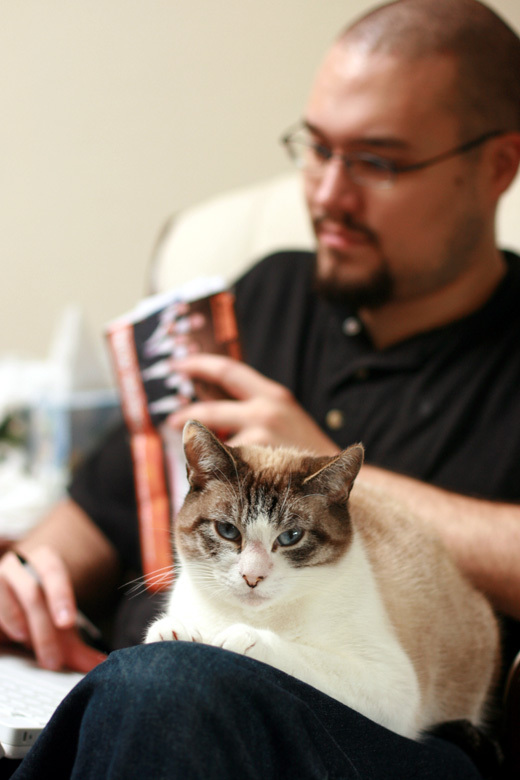 I handled all the business matters, but I had already learned a thing or two from having my own editing business, and both Sam and I went on every cat visit. 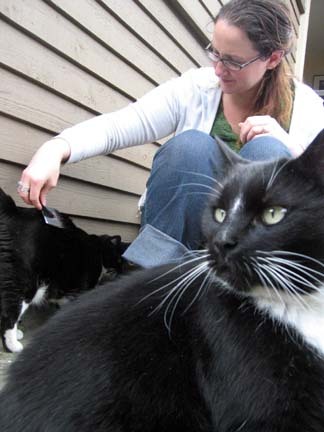 When people went on vacation or business trips, we would show up at their houses once or twice a day to feed their cats, give them lots of rubs, play with our super cool toys , and handle any medicating (we had diabetic cats on our list, for instance, so we had a vet tech show us how to do injections and pilling). It was a pretty fun job — but a lot more work than we'd anticipated. Despite what we thought was a ludicrous half-hourly rate, it turned out we weren't really making much per year. We could have made twice as much if we'd split up (although we had just the one car). Much of our cat-sitting time was spent driving from place to place. And holidays were pure torture. One Christmas, even as we shortened our usually generous 45-minute visits to 15-20 per cat, we worked 20 hours straight. Keep in mind there are only 24 hours in a day, and realize that those leftover four hours had to contain all the sleep we would get. It was pretty brutal. On the side, then, Sam had been quietly ramping up one of his hobbies: selling DVDs. It had started in Indiana when he simply wanted to sell off his extensive VHS collection (did I mention we're old?) to upgrade to DVDs, and he knew there was a relatively short window that his tapes were still worth something. And then the internet took off (do you remember those heady days? ), and there were coupons left and right that promised things like "$30 off $30 orders!" (this is why so many of those businesses failed, fyi), and Sam took advantage of every single deal. Again, at the time it was just a hobby — he was trying to buy DVDs for himself, but to fill out the order and use the coupons, he would throw in a couple DVDs he could resell. So, when we lost our steady paychecks and were first starting cat sitting, he started doing the same thing, only more intentionally. Which was a good thing, because we started our cat sitting in January and got our first paying client in March. It really wasn't until August that we were working steadily, so the DVD sales helped support us in the meantime. We were talented at combining both businesses. We were really poor that year. Like, really poor. I remember getting holes in my socks and debating whether I could afford to replace them and deciding against it. We lived off Big Lots food (we stockpiled this incredible 59-cent pasta and ate it all.the.time) and scrounged in the Dumpster for more things to sell. 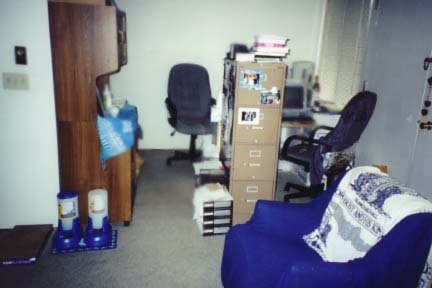 We lived in an apartment complex in the university neighborhood where people, when they moved out, simply tossed perfectly good items rather than take the effort to haul them to the thrift shop. We added furnishings and home goods to our apartment by scanning the free discards left curbside. Our parents were worried about us. Our pastor was worried about us. Everyone wanted us to grow up and get a real job. Because, despite being financially poor here, we were privileged: We were college educated. We had skills and training. We could have gotten real jobs. We had family willing to support us with loans until we got back on our feet. We had some savings set aside. We were in good health. We fit societal norms of the type of people you feel comfortable giving your key to along with the knowledge of when you'll be on vacation. I know not everyone has those advantages when starting a business. Cats don't care if you multitask. Anyway, an interesting thing happened when we did our taxes the following year. 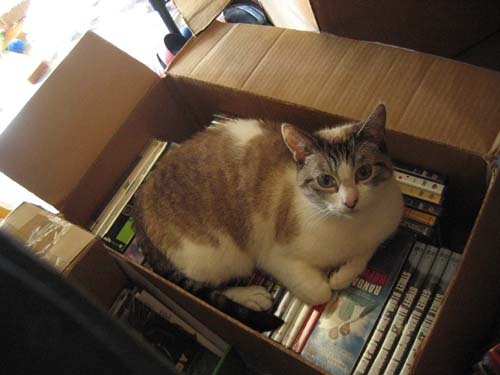 We found out we were making more on DVD sales than on cat sitting — even though the DVD thing was just a side job that we fit in while we were doing our main business. We'd often bring packages to wrap while we sat with the cats. One of us would play and pet the kitties, and the other would tape envelopes. Sam decided to build the DVD business even further and started investing, as we could, what little money we had into inventory. We also decided, even though we were still financially a little rocky, to start a family, so we got pregnant — and miscarried. But then we got pregnant again. Finnish - ack! I studied abroad in Finland, don't ask, and learning the language was nearly impossible. I learned how to order 1. Coffee and 2. Beer. Mikko and Jakko were my fav Finnish names. Gotta love the double consonants. I'm hooked! Can't wait for part 2.